Do you have a wish list? It seems I always have at least a little one in the making. Not things I can’t live without, not anything I HAVE to have, but always a few things that I think would be really nice. There was one thing that remained on my wish list for years; it was sort of silly, but nevertheless something I really wanted. What I really wanted was a big wicker basket for my bicycle. Natural would be my choice, but I also would have been quite happy with a white one. I’ve loved bike riding for as long as I can remember and thought it would be really fun and quite “European” to have big wicker basket. I could carry groceries, snacks, picnics, etc. The problem was, according to my husband and son, that “real bike riders” don’t have baskets, especially wicker baskets. They have little zippered pouches attached to their handlebars if anything. They said that, since I had a “real” bike: decently light, 10 gears, with good tires, wheels and brakes, that I didn’t need things like baskets weighing it down. Plus, they made it quite clear that wicker baskets on bikes looked sort of ridiculous for a “real biker”. I didn’t really care about looking like a “real biker” or even about the weight. I just thought one of those pretty, wicker, big baskets would be really cool. Hopeless romantic that I am, I dreamed about taking bike rides with the basket filled with cheese, fruit, a crusty French baguette, a blanket for a picnic, maybe even a bottle of wine and a few fine chocolates. Oh, and along the way, I could stop and pick a bouquet of wildflowers and tuck those in the basket too! The whole thing seemed like a pipe dream. But lo and behold, one day, just before Mother’s Day several years ago, the doorbell rang. When I opened the front door, there was a big brown package – with my name on it. It was from my son, Nick and his wife Lindsay. I tore open the box and couldn’t believe my eyes. Yes, it was the basket for my bike!! Well… not a wicker basket but a really nice black wire basket to go on my handlebars. I couldn’t wait for Scott to install it. I loved that basket and filled it, as you might imagine, with all sorts of good things. If you were taking a bike ride with me, you’d never know what I’d pull out half way though the trip. 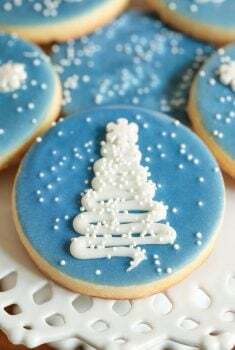 Sometimes it was a bag of cookies like these I Want to Marry You Cookies or perhaps these Double Chocolate Sugar Cookies, or maybe thermoses of milk and a few Morning Glory Muffins. 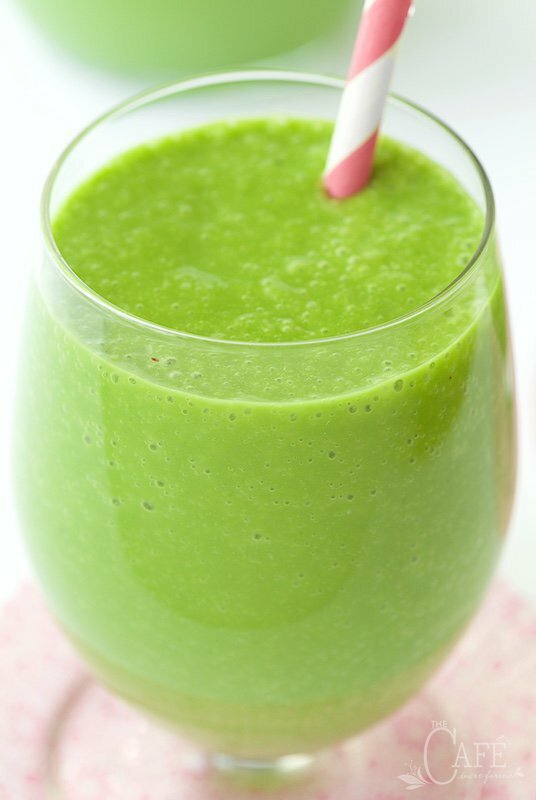 It might be something super healthy like a Peach and Fresh Pineapple Green Smoothie, one for you and one for me – in nice insulated bottles. I had plenty of room in that basket! Sadly, the basket didn’t last super long though, only about 9 months. The holidays rolled around that year and Christmas morning, I came downstairs to find a delightful surprise. A brand new, shiny, super nice (more “real”), 18 gear bicycle under the tree! I loved this new bike from the start, but there was one problem. With the fancy gears, odometer, etc. there was NO room on the handlebars to attach my basket. Just enough room for a small little zippered pouch. Oh well, it took me awhile, but I guess I’ve just learned to think a bit smaller, maybe more like a “real biker”. I still take treats along on our bike rides, but usually these days it’s just a small container or two of Greek yogurt, some fresh fruit in a little baggie and a small sack of granola. We’re biking much farther these days, and really need something that will satisfy and give us lots of energy. These Dried Cherry and Almond Energy Bars are the perfect snack to take along on our bike adventures. Yes, they fit quite nicely in my little zippered bag, but they’re also crazy delicious and full of wonderful, healthy ingredients. In addition to the dried cherries and almonds, they contain pecans, walnuts, sunflower seeds, pepitas, sesame seeds, flax seed, chia seed, rice syrup (or honey) and coconut oil. See what I mean about healthy? 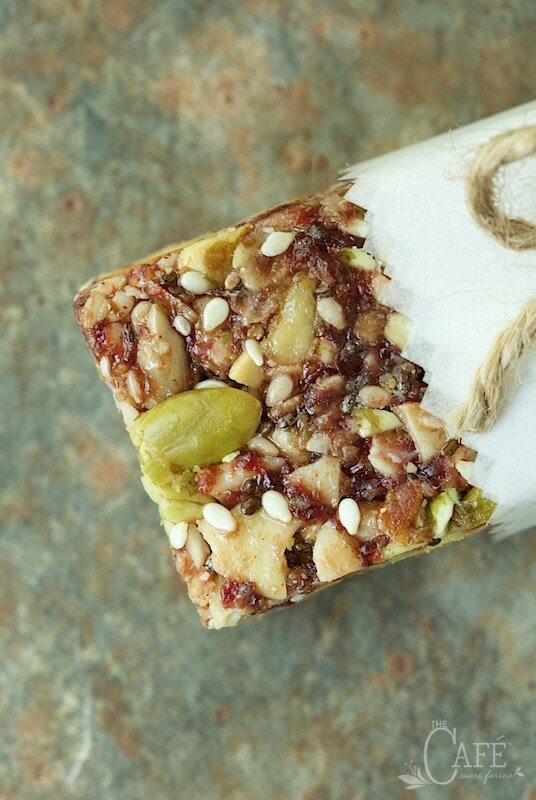 One of these yummy bars will satiate us for miles and miles. 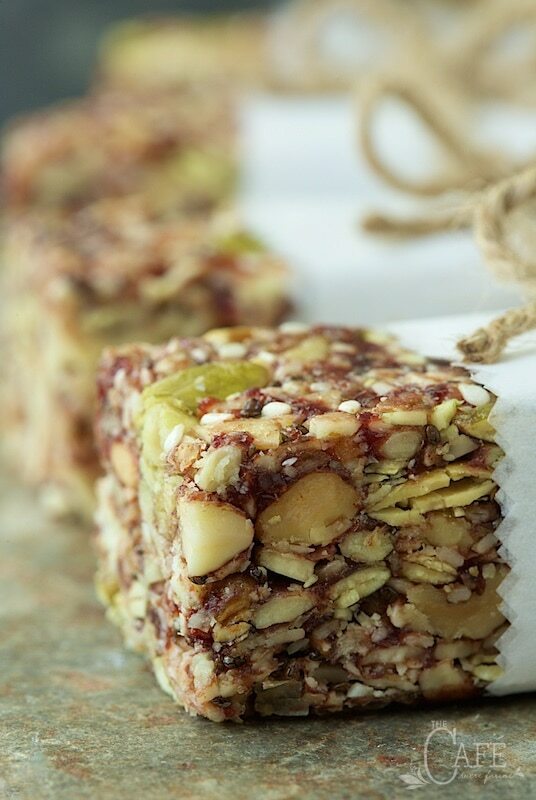 I adapted these Dried Cherry and Almond Energy Bars from my Paleo Granola recipe. 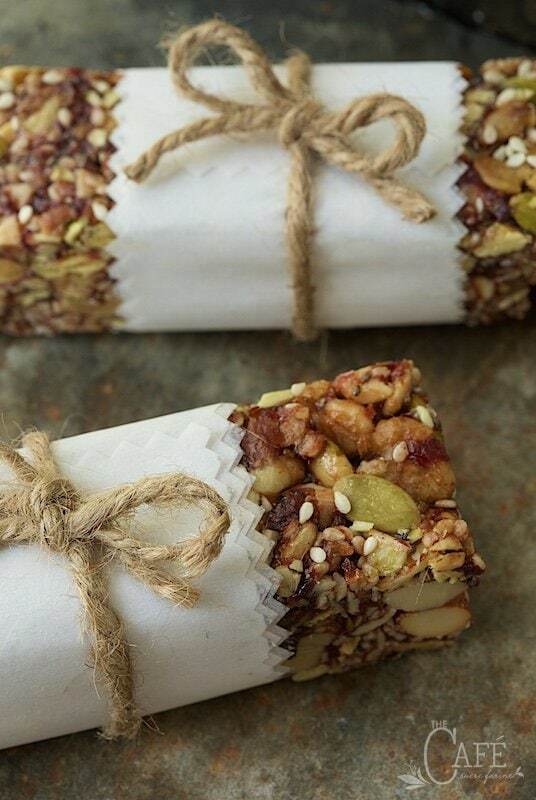 We’ve enjoyed this granola so much I thought it would be fun to transform it into bars. It took me a few tries, because at first, they didn’t hold together well. No matter how hard I tried to compress them, as soon as I removed the bars from the pan, they crumbled back into granola. Then I saw an idea in Bon Appetit for energy bars that used a “glue” made from dried fruit and rice syrup (or honey) combined in a food processor. Although I didn’t use their recipe, I tried this technique for my bars and it worked like a charm. After perfecting the recipe, I gave a sample to my son Nick, explaining to him that they were similar to Kind Bars, which are hugely popular right now. He took a bite and said, “Mom, they’re better than Kind Bars!”. I felt like that was a “real” compliment. And you know what? I bet he would feel like a “real biker” with one (or two) of these delicious energy bars tucked in the back pocket of his biker shirt! 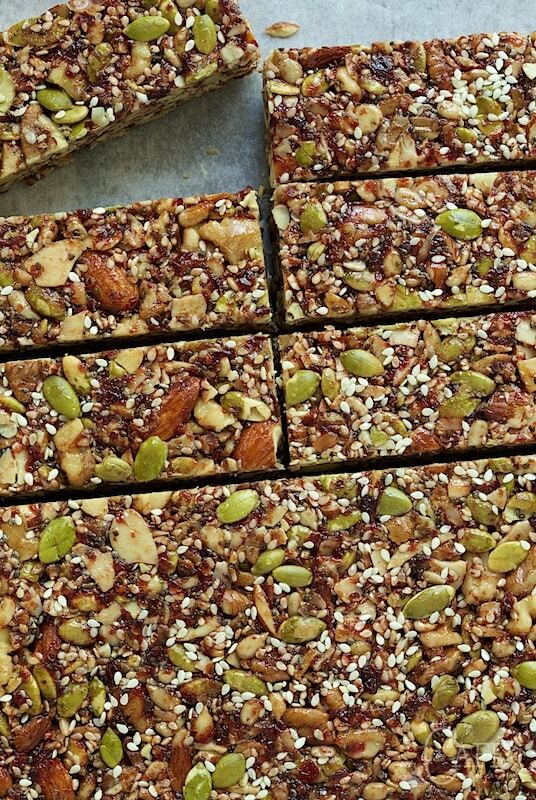 Whether you bike or not, I think you’ll love these wonderful, healthy bars. They’re great for breakfast, snacks, school breaks, hiking, anytime you need a super tasty, compact, healthy treat. They freeze well too. I like to make a double batch and pop most of them in the freezer. I just pull a couple of them out at night and throw them in a ziplock bag. In the morning, Scott and I are ready to hit the road on our horses bikes. P.S. I asked my son if there was anything a “real biker” could do that would be as ridiculous as sporting a big wicker basket on the handlebars. He said “maybe wearing a chicken suit while riding”. 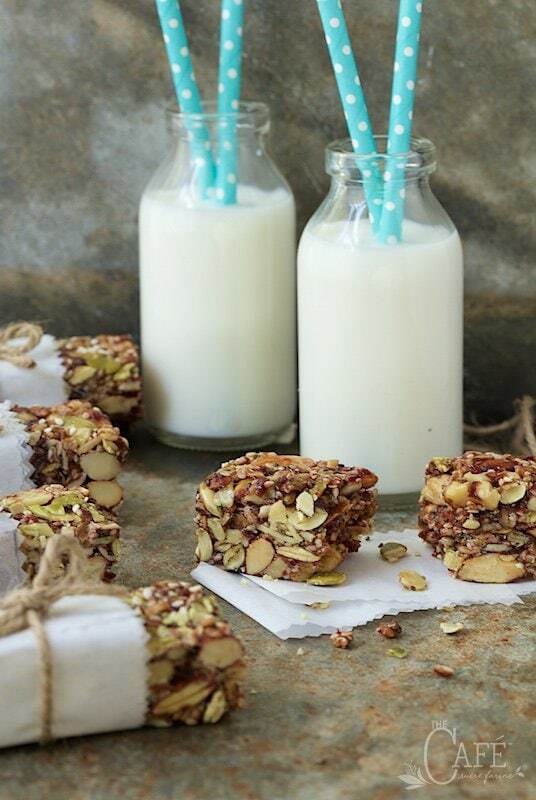 These bars are crazy good AND incredibly healthy! They're perfect for breakfast, snacks, school or work breaks, hiking, biking, anytime you need a super nutritious snack on the run! Preheat oven to 300˚F. Lightly grease an 8-inch square baking pan, then line the pan with parchment paper with ends extending over 2 edges of the pan. Set aside. Place nuts, seeds and coconut flakes on a sheet pan. Add the 3 tablespoons of coconut oil and 4 tablespoons of rice syrup. Stir to combine. Place in oven for 20-25 minutes or until mixture begins to turn golden, stirring well every five minutes to redistribute. Remove from oven andallow to cool for 5 minutes. Reduce temperature to 250˚F. While nuts and seeds are toasting, combine cherries, 2 tablespoons rice syrup, 2 tablespoons coconut oil, cinnamon salt and vanilla in the bowl of a food processor. Process for 1 minute or until mixture is fairly smooth. Combine toasted nut/seed mixture and cherry mixture from food processor in a large bowl. Stir with a large spatula to combine. Cherry mixture will be thick, so you'll need to work it into the nut/seed mixture. Keep stirring and working the cherry mixture in until there are no large chunks left. This will take several minutes and will be easier if you don't let the nuts cool down too much. I like to put my bowl in my sink as it's much easier for me to stir it and work the cherry mixture in from above. These silicone spatulas with wooden handles are some of my favorite kitchen tools. They're inexpensive, sturdy and you don't have to worry about the handles melting if resting on a hot pot. I have a zillion of them and and you'll often find every last one of them in my dishwasher as I use them ALL the time. They're perfect for a job like this. Transfer mixture to prepared 8-inch pan and, using a lightly oiled spatula or oiled fingers pat mixture firmly to an even layer. Place pan in oven. 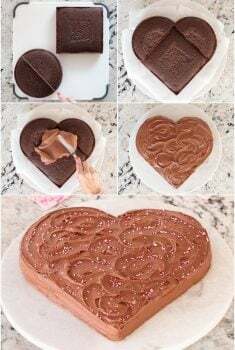 Bake for 30-35 minutes or until bars are no longer sticky. 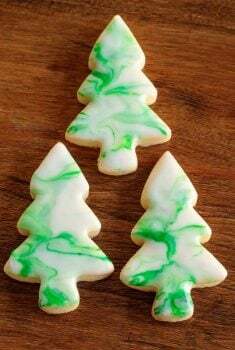 Cool in pan, then remove (with parchment paper "handles") to a cutting board and cut into 1 x 4-inch bars. If smaller servings are desired, cut into 1 x 2-inch bars. Store in an airtight container. You can also freeze bars, uncovered, on a sheet pan. When frozen, transfer to a ziplock bag or airtight container. Thaw before serving. *I really like the dried cherries at Costco. If you don't have a Costco nearby, you can also order them online. This recipe is very flexible. If you don't have or don't like one of the nuts and/or seeds, just substitute what you have or what you like. Just keep the proportions the same. For the dried cherry mixture, you have sub other dried fruit like raisins or dried cranberries. Just keep the proportions the same. These bars are fairly thick. I usually cut them into 2x1 inch bars but if you like a thinner bar, just make them in a 9x13-inch pan. I often purchase my pepitas and sesame seeds at a nearby Mediterranean market. They have them in bulk and they're WAY cheaper than Whole Foods. Trader Joe's is also a place where you can find nuts and seeds for a reasonable price. This recipe is exactly what I’ve been looking for! I can’t wait to try it! I noticed that many of your recipes have nutrition info, but not this one. Would you happen to know the calorie and protien amounts in these bars? Thanks for so many great recipes! 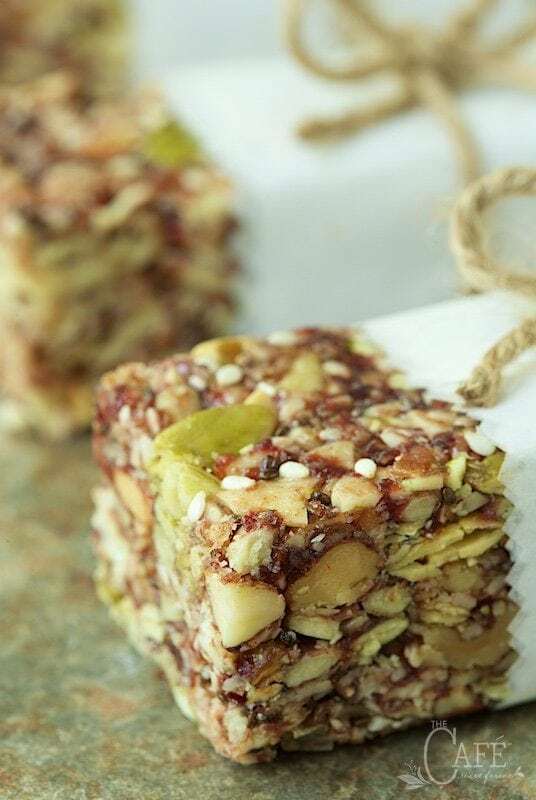 I eat a lot of store-bought granola bars for breakfast, which are all quite high in sugar, I’ve been looking for a relatively easy homemade recipe for breakfast bars so I could just make them at home and control what goes in them. 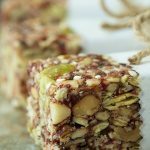 I really like that this recipe includes both flax and chia seeds! Thanks Seth! So glad you enjoyed them! Thanks so much Bonnie, such a sweet, kind comment. I appreciate your encouragement. Congratulations on your grand baby to come! That’s very exciting! This is my favorite site. I just love the recipes and the stories just brightens any day. 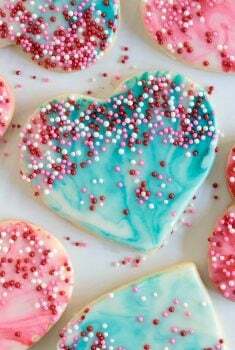 I will be making these for my daughter who is expecting in Feb. and of course for me. Glad to find healthy freezable food. Good thing to stock up on. Please keep the fantastic recipes and stories coming. Thanks. Oh my goodness these are amazing!!! Didn’t have cherries so I used golden raisins – delicious! Didn’t have chia seeds, left them out, but will get them for next time. I used salted roasted pepitas and cashews so I deleted the salt and didn’t roast these in the oven with the other nuts. 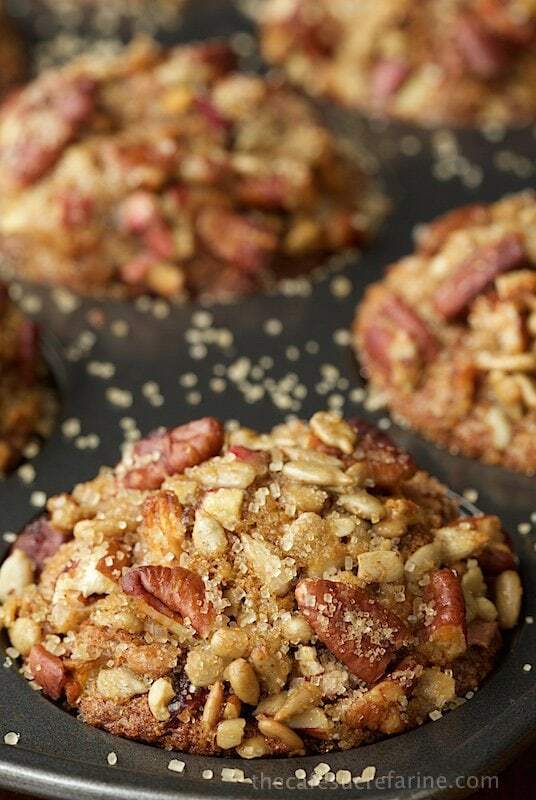 I used my hands (best tools in the kitchen) to mix the raisin and warm nut mixture – perfectly easy. And they turned out FANTASTIC!!! I let them sit on the counter over night and they sliced perfectly and did not fall apart all. As soon as I get to the store I will get all the ingredient to make them as Chris did but these are soo good. I was so grateful that Chris said this recipe it flexible because it really is. They are soo much better than store bought!! Celeste, I love your creativity! So inventive, and I’m glad you enjoyed them! 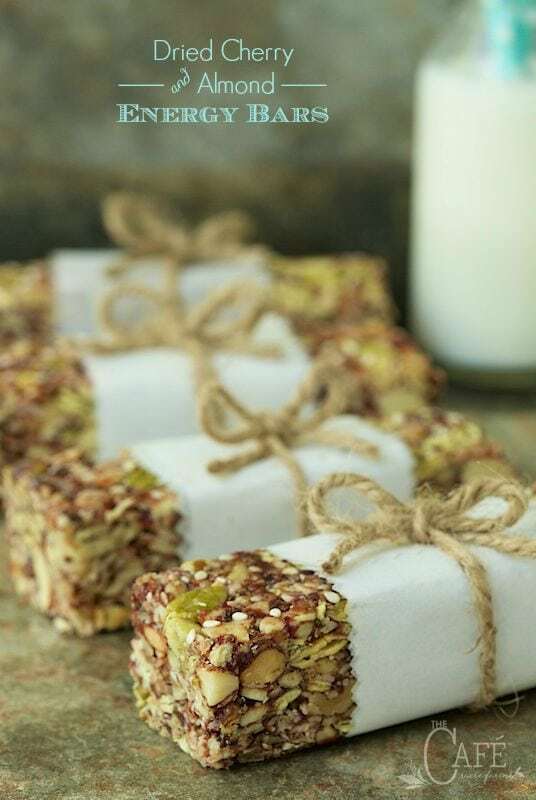 When my children were young it was all about “the cookie” … as adults who enjoy the outdoor lifestyle of CO these cherry/almond bars are PERFECT! Hiking, biking, snowshoeing, camping will be better enjoyed with these nutritious offerings. Thanks for sharing of your time and talent! Can I substitute honey for the rice syrup? I haven’t tried that Barbara. It may make the bars not as cohesive, but I’m not sure.